Louisville, KY – He was the first American in 25 years to win the Rolex/FEI World Cup Final, highest placing U.S. Equestrian at the London 2012 Olympic Games, and winner of all four observation classes he entered. 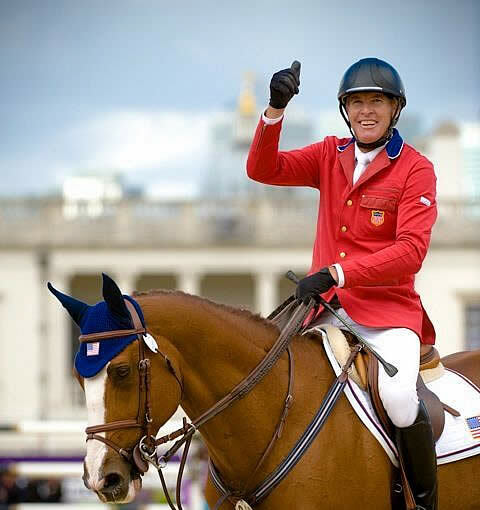 Now you can call Rich Fellers 2012 USEF Equestrian of the Year as well. Eight equestrians were nominated for the award and Fellers was revealed as the winner Saturday night at the USEF Pegasus Awards in Louisville, KY.
Fellers’ successes in 2012 made for a season few fans of show jumping will soon forget. With Harry and Mollie Chapman’s small but spectacular mount Flexible (who was named USEF International Horse of the Year on Friday), Fellers was unbeatable for a good portion of the year. Their memorable stretch began in s’Hertogenbosch, The Netherlands where they bested eventual Olympic Gold medalists Steve Guerdat and Nino de Buissonnets by .64s in a jump-off for the Rolex/FEI World Cup Finals Championship. After returning to the U.S. Rich and Flexible, already on the long list for London, entered four Observation Event classes and won them all. Included in those victories were such prestigious classes as the $100,000 Hermes Grand Prix of Del Mar and the $200,000 CN Performance Grand Prix at Spruce Meadows. Buffalo, NY – January 1, 2013 – SBS Farms, Inc. exemplified the meaning of victorious during the 2012 year. The team took home top honors at the most prestigious horse shows and events across the nation, with Jennifer Alfano and Jersey Boy rising to the pinnacle of their career with their win at the 2012 USHJA International Hunter Derby Finals in Lexington, KY, in August. 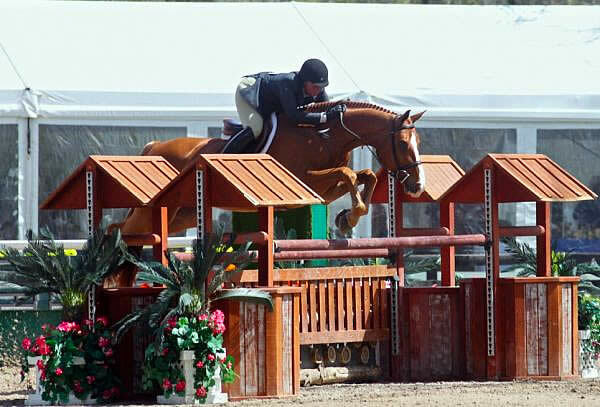 Trainer Susie Schoellkopf and professional rider Jennifer Alfano are now gearing up for the 2013 show season, where they will showcase their skills, and those of their students in the hunter and jumper venues. Last year, Jennifer Alfano and Jersey Boy stole the spotlight during the final week of the Jacksonville Winter Series, held at the Clay County Fairgrounds in Green Cove Springs, FL. 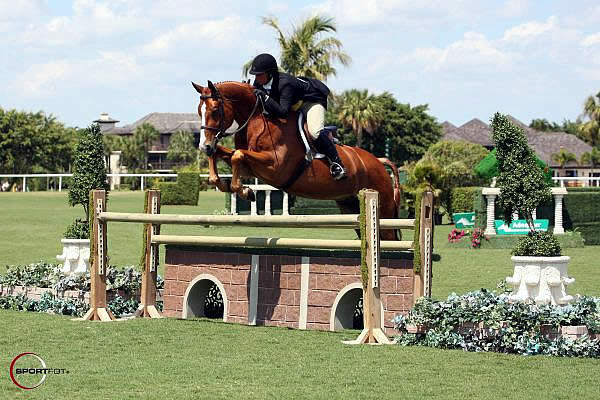 The pair rode to the top of the standings during the $25,000 USHJA International Hunter Derby at Jacksonville Winter A to Z. They also took the reserve championship in the High Performance Hunters. Alfano also showed Sharon O’Neill’s Rose Hill to the Second Year Green Working Hunter Championship. Buffalo, NY – December 27, 2012 – Time is running out to vote for the 2012 USEF Horse of the Year Award and the 2012 USEF Equestrian of the Year Award. Voting will run through midnight (EAT) January 7, 2013, with the champions claiming their crowns on January 18 during the 2013 USEF Annual Meeting as part of the 2012 USEF Awards Celebration. To place your vote for Jennifer Alfano as the 2012 USEF Equestrian of the Year, please visit http://www.usef.org/_IFrames/eoty/. To place your vote for Jersey Boy as the 2012 USEF Horse of the Year, please visit http://www.usef.org/_IFrames/hoty/ and type in your email address to access the voting portal. This is the first year that Alfano has received the coveted Emerson Burr Trophy, as well as had the honor to claim a place among the eight nominated athletes of the equestrian sport. 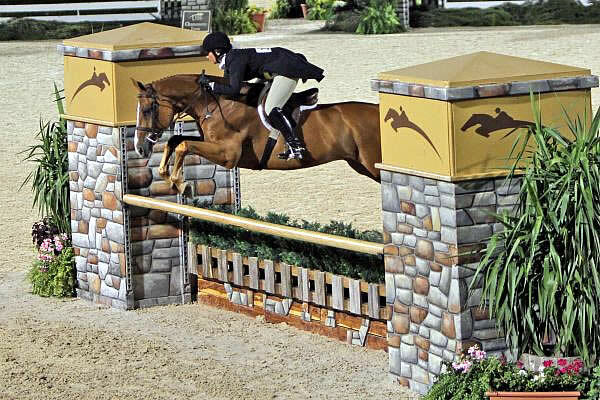 As a two-time World Champion Hunter Rider in 1996 and 1997, Alfano has nabbed the coveted Leading Hunter Rider Award at the Pennsylvania National Horse Show, the National Horse Show and the Ocala HITS winter circuit. She was the Top Grossing Rider with over $400,000 in earnings in 2010, and currently sits second in the USHJA Lifetime Rider Standings with an astounding $299,650 earned in International Hunter Derby winnings, with $70,000 earned in the 2012 year alone. The National Show Hunter Hall of Fame voted Alfano 2009 and 2011 Hunter Rider of the Year. 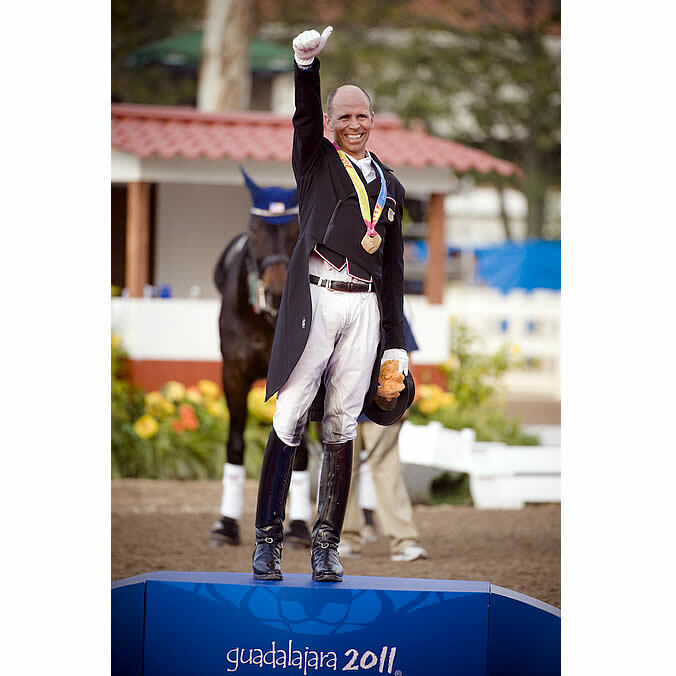 Thousand Oaks, CA – December 22, 2012 – After topping the Paralympic equestrian ranks at the 2012 London Paralympic Games and earning the highest ranking among the United States Equestrian Olympic and Paralympic Team, Jonathan Wentz of Richardson, Texas was on top of the world. The duo of Wentz and NTEC Richter Scale were synonymous with dynamic duo. Wentz was a team player, a hard worker, and someone who always put his horse first. 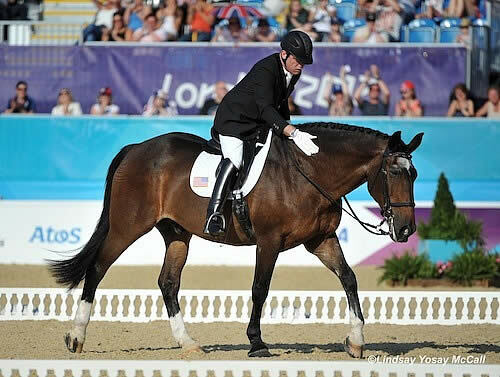 Tragedy would hit the equestrian community at the end of September 2012 when Wentz passed away due to unknown causes only two weeks after his Paralympic debut. Wentz was back at college at Southern Methodist University where he was in his senior undergraduate year. Just days before his death, Wentz gave a speech in front of his peers and spoke about what it meant to him to become a Paralympian. Wentz was a leader in and out of the classroom and took his role as a U.S. athlete seriously. The 21-year-old 6’5″ Texan was diagnosed with Cerebral Palsy at birth and didn’t let his diagnoses define him. He was the epitome of a champion, achieved the goals he set-forth, and truly loved his sport and his fellow teammates. Buffalo, NY – December 14, 2012 – Professional hunter rider Jennifer Alfano and the stunning Hanoverian gelding Jersey Boy have become household names in the hunter industry over the years. With their recent victory during the 2012 $100,000 USHJA International Hunter Derby Finals – a feat which had eluded the pair in their lengthy list of accolades – it is no wonder that the dynamic duo has been nominated for the 2012 USEF Equestrian of the Year Award and the 2012 USEF Horse of the Year Award. Voting will run through midnight (EAT) January 7, 2013, with the champions claiming their crowns on January 18 during the 2013 USEF Annual Meeting as part of the 2012 USEF Awards Celebration. This is the first year that Alfano has received the coveted Emerson Burr Trophy, as well as had the honor to claim a place among the eight nominated athletes of the equestrian sport. Alfano is no newcomer to the honor of awards in the hunter ring, consistently proving herself as the crème de la crème of the hunter industry. USEF Announces the 2012 Equestrian of the Year Nominees; Voting Is Now Open! Lexington, KY – Voting is now open for the coveted 2012 USEF Equestrian of the Year award. Following decades of tradition, the winner will again be announced when the horse world meets at the United States Equestrian Federation’s annual Pegasus Awards gala. This year’s gala will be held on Saturday, January 19, 2013 at The Henry Clay in Louisville, Kentucky and broadcast live on the USEFNetwork presented by Smartpak. Known as the USEF Equestrians of Honor, eight stars of equestrian sport across breed and discipline recently received a unique competitive trophy. Just one of them will win the distinguished grand prize and be named the “2012 USEF Equestrian of the Year”. The William C. Steinkraus Trophy is presented to an equestrian competing in the Olympic disciplines of dressage, eventing, or show jumping. The 2012 USEF Annual Meeting in Cincinnati, OH ended on Saturday night with a Pegasus awards show that was broadcast around the world. Steffen Peters was chosen from a fantastic group of nominees and earned the night’s top prize, Equestrian of the Year, for the third time. Opting for a slideshow rather than a speech Peters thanked in pictures Ravel, Weltino’s Magic and, among many others, his wife Shannon. 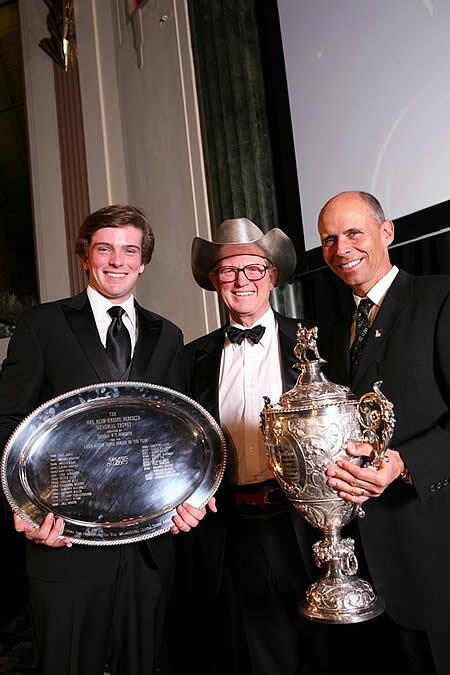 James C. Wofford was honored with a lifetime achievement award (you can view a video about his life and achievements here) and Jacob Arnold accepted the award for 2011 Youth Equestrian of the Year. On demand video of the Pegasus awards, along with pictures and video from Friday’s Horse of the Year celebration, is available here on the USEF Network. Cincinnati, OH – To cap off a record-setting year, dressage superstar Steffen Peters added one more record to his résumé on Saturday night at the United States Equestrian Federation’s Pegasus Awards dinner. 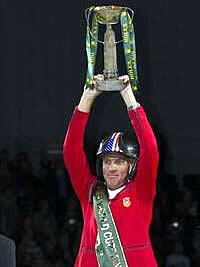 He became the first person to score the USEF’s Equestrian of the Year title three times. Peters (San Diego, CA) won the top honor in 2008 and 2009 based largely on his accomplishments with Akiko Yamazaki’s phenom Ravel – but in 2011, Ravel had some help. Peters capitalized on his first trip to the Pan American Games and scored Team and Individual Gold in a tremendous effort with Jen and Bruce Hlavacek’s Weltino’s Magic. From California to Aachen, Germany Peters was undefeated in 2011 with the now 9-year-old Westphalian gelding. Both Ravel and ‘Magic’ scored at the 2011 Collecting Gaits Farm/USEF National Dressage Championships in Gladstone, NJ in September sweeping the Grand Prix and Intermediaire I divisions respectively. Peters won all six classes in the effort and secured his Pan Am spot with Magic in the process.